2015 Human Services Summit presents strategic steps for generating stronger, healthier individuals, families and communities. How can human services leaders accelerate progress toward social change? It’s a key question for organizations throughout the sector. And at the 2015 Human Services Summit, participants focused on identifying the answer. Supported by Accenture, the Summit brought together human services organizations from around the world, leaders from the American Public Human Services Association and academics. Innovation was a central theme. Many organizations are attempting to transition from legacy systems to more user-friendly technologies. It’s a challenging but essential journey. Traditional, siloed systems stand in the way of transparency, self-service and caseworker efficiency – all must-have qualities in the drive toward improved human services outcomes. Discussion centered on developing the skills needed to enroll a new generation of employees, adapt to and internalize change, and sustain incremental innovation over time. The Human Services Value Curve provided the framework for this critical agenda. 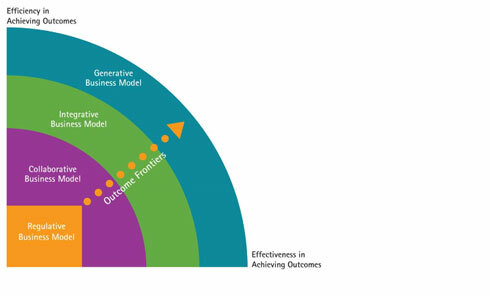 Developed by Leadership for a Networked World, this provides a map for tracking progress toward a ‘Generative Business Model’ built on seamless collaboration and coordination across health, human and social services. A recently published IDC Government Insights Perspective provides highlights from The 2015 Human Services Summit: Emergent Leadership – Turning Ideas into Outcomes, which ran from October 23-25, 2015, at Harvard University. Accenture provided support. The event focused on implementing emerging ideas for realizing capacity and outcomes, and establishing an organizational culture that can drive toward increased innovation. The Human Services Value Curve guided discussions at the Summit. Based on best practices, this provided context for how best to advance from a Regulative Business Model (with multiple siloed views of the client), through a Collaborative Business Model (where caseworkers have a single view of the client, often via a mix of traditional and modernized business processes), on to an Integrative Business Model, with a single view of the client enabled through an integrated enterprise system (with modernized business processes). Dr Ron Heifetz, founding director at the Center of Public Leadership, Harvard Kennedy School, set out a practical framework for turning ideas into outcomes. Cautioning against trying to change too quickly, he advised leaders to build on what they have, to help their people help themselves. The huge importance of new tools and technologies was another key focus. As they progress up the Human Services Value Curve, organizations will develop and deploy capabilities that deliver holistic, integrated omni-channel services. Big data and analytics have a vital role to play, and some participants highlighted the value of data visualization for enhanced decision-making. The journey toward a generative business model is neither easy nor rapid. It demands planning, resources, collaboration, and a real commitment to generate long-term success for individuals, families and communities. Events like the 2015 Human Services Summit are a key driver of this journey. Participants at the event shared vital experience of innovation – including – new technologies. They also discussed the importance of community knowledge, awareness and support. By keeping a focus on families and harnessing views from a broad community of interests, human services organizations can change public opinion and effect positive change. Leaders must develop the skills they need to enroll employees, allowing them to adapt to and internalize change. As well as adopting new technologies, it’s critical to foster an environment where change can happen. This means generating lots of small experiments to produce incremental innovations that, in turn, generate major change over time. Making it safe to fail will continue to unleash employee buy-in, change and innovation.